We are offering 3 for 2 on all bookings on Sunday’s in April. Book two places, get the third place free. 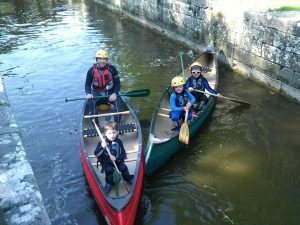 Four unique guided canoe trails available to book online now! 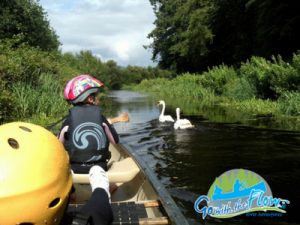 Based just outside the charming village of Borris in Co. Carlow, here we have a stunningly beautiful canoe trail with lots of things to see and do enroute. Get geared up in the changing facilities on site. Everybody will be provided with the required gear including wetsuits, buoyancy jackets and helmets. Experienced personnel will be on the water with you at all times. Safety chat with your instructor before getting on the water. Followed by a demonstration – how to hold the paddle and what strokes to use. Beginning with 10 minutes warm up in the Old Harbour – We start off in an area of flat calm water to learn the basic strokes, build your confidence and then off we go. Rising up through a lock system typically found on a canal which gives us access to the river. On the canoe trail there are weirs and rapids so expect a few spills and thrills but nothing scary. Along the way there are old lock keepers cottages, scenic waterfalls, and old castle and eel weirs and of course breathtaking views. Finally we transfer back onto the Barrow Navigation using the lock and head back up the river to where we started. You will have a ton of fun. Our events are run in a safe environment and are suitable for all ages. You will be laughing from start to finish and beyond !! We offer a choice of using Canadian canoes, Sit-on-top kayaks or river surfers. There are toilets and changing rooms onsite and you return to the same spot as you started. Furthermore we will supply a digital photo album of your event FREE. 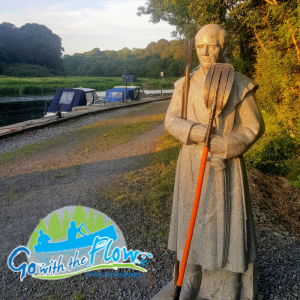 This guided canoe tour begins at Goresbridge and you will travel through lower Ballyellen, Ballytiglea, Borris House Estate, Clashganny and Graiguenamanagh. Along the way you will be passing through beautiful, wild rural countryside. You will travel along some of the old navigation used by the Guinness barges of the past and see many of the old lock houses. Typical wildlife to be seen – Herons, kingfishers, dippers, duck, swans cormorants and egrets and I could go on …… did I mention the otters. Meeting in Goresbridge, this guided canoe trail heads south down the Barrow River from Goresbridge. As the river gently turns through a sweeping right hand bend as the 200 year old Barrow navigation lock house comes into view. Lower Ballyellen lock house is located just across the river from Barrowmount House – the home of the Gore family from 1710 to 1863. Sir Ralph Gore built the bridge in 1756 and the town was named after the family. Paddling on through serene and majestic pine woods on the right and the old horse towpath on our left we soon arrive at Ballytiglea Weir. The weir itself is low enough but provides a stunning backdrop to a contempory wooden hunting lodge which looks on from across the flood plain. Once over this man made dam which backs up the water level to maintain the navigation your next river section is reasonably shallow. The water squeezes between Granite boulders as it drops towards a left hand turn and enters a more agricultural hinterland. Up ahead is Ballytiglea bridge – a five arch granite structure which carries the Borris to Graignamanagh road over the Barrow river. The exact date of this bridge is unknown but it was on Taylers and Skinners road map of 1783. 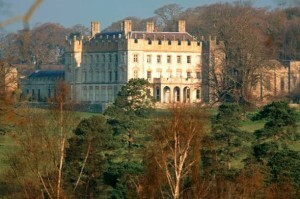 We will shortly be entering the Borr is Demence – take the navigation channel where the river is placid and winds it way through the quiet oak woods of the Borris House Estate. 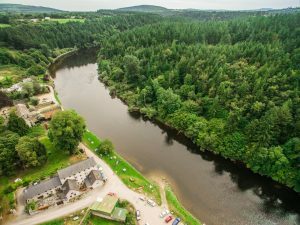 The paddle through the ancient estate leads you to Clashganny and follow along after all this excitement with a paddle through the pine forest – as you make a quiet entrance into historic Graignamanagh. Our route ends in Graiguenamanagh, a picturesque abbey town and a popular boating and craft centre. Overlooking the River Barrow is Duiske Abbey founded by Norman monks from Stanley Abbey, Wiltshire in 1204. The “Early English” design boasts a lofty nave and it is the largest of Irish Cistercian monastery churches. Stop off here and have a look around and a bit of lunch. There is a beautiful old abbey and some very quaint shops and pubs. 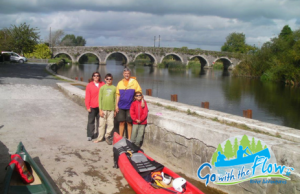 If you have time, follow the Graiguenamanagh Historic trail. Clashganny to St. Mullins guided canoe tour. Clashganny to St. Mullins Guided Tour along the beautiful River Barrow. So much natural beauty to be seen along the way. 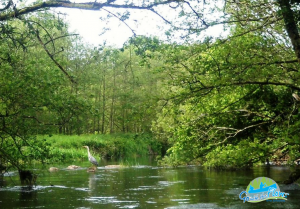 Enter the Barrow Gorge at Clashganny and enjoy the stunning vista as the River squeezes between dramatic forested hills on either side. Keep an eye out for the wildlife you might meet along the way. 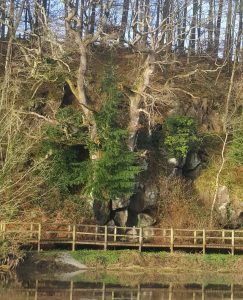 Before entering medieval Graiguenamanagh, you will pass Silaire Wood on the right where the majestic 800 year oak tree towers over the River Barrow, it appears to grow from the Rock of Silaire. Graiguenamanagh is a medieval town dating back to 1204, nestled in a wooded valley between Mt Brandon and the Blackstairs Mountains. You will pass under the beautiful and historic seven-arch stone bridge and into some truly stunning scenery. There will be some wiers and rapids along the way but nothing too scary! Old Castles and lock houses will be visible en route. 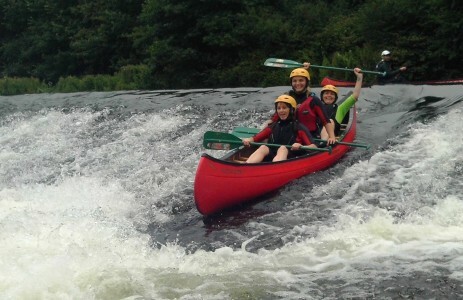 You will be paddling through one of the most visually appealing river valleys in Ireland. A pilgram route for thousands of years. This is something to immerse yourself in and not be rushed. Arriving in St. Mullins, a village steeped in History, built on an ancient Monastic site. Let the historian within you explore the village. St Moling founded a monastery here at the end of the 7th century. He may have been Bishop of Ferns and also of Glendalough. The Kings of South Leinster, including the McMurrough Kavanaghs, were buried here. There are remains of several churches. These include St Mullin’s Abbey, a medieval nave-and-chancel church with a spiral stairway, and St James’s Chapel, a small oratory dedicated to St. James and the people who stopped here on their way to the camino – Santiago de Compostela. Finish your trip with a treat from Mullichain’s Cafe on the quay! Zero to Hero – one to one canoe training Competition Time!